If you were stranded in the wilderness, your survival would hinge upon your ability to find water, food, and build a shelter to protect against the elements. Thriving in the PR trends of the world also requires certain skills and resources. Many of these are innate, like creativity and organization. Others, however, require a little bit of hunting, like rustling up a meal on a deserted island. Tracking down current and emerging PR trends is such an activity. PR professionals typically get in the habit of talking about emerging trends at the start of the year. We like to look out at what’s to come and what can be expected of us in order to gain an edge in the coming year. The drawback to this strategy is that trends often develop much, much quicker than 365 days at a time. Some trends are closer to predictions, which means there’s no guarantee that they’ll even come to fruition in the first place. We’re all guilty of becoming over-excited about a trend or promising new tech. Others take time to fully mature. Sometimes, a trend appears to be a bust, only to emerge from its own ashes a champion later in the rankings, as other shifts create a more ideal environment for it to thrive. Even social media titans, like Facebook, took some warming up to from businesses before it earned its status of a must-do strategy. Thus, instead of waiting for 2019 to re-introduce new PR trends, let’s re-examine our checklist from 2018 and see what’s changed, what’s new and what the rest of the year will bring. With Facebook and other social media platforms perforated with “fake news”, mass media moguls plagued by scandals left us all in the middle to figure out what’s real and what’s misinformation online. The news media is not having its best years. 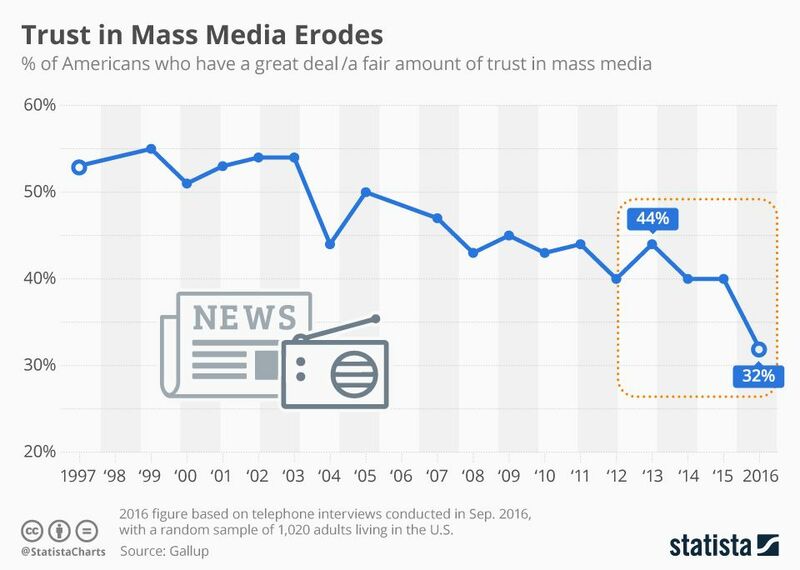 Trust in media has nosedived so significantly in the past few years. This distrust and loss of media credibility has a trickle down effect on all of us creating content. No matter the source, audiences are beginning to look more skeptically at what’s being said, where data is cited from, and more. PR and digital professionals have to take a detailed look at the media sources they leverage and where public opinion (particularly of their target audiences) stands on those outlets. Issuing press releases through untrustworthy sources, or even citing an article or information shared on these platforms, could have a damaging effect. By strategically choosing media outlets that your audience still trusts, you can ensure that you don’t lose your own media credibility. Creating a statement about the importance of media credibility may also be a good tactic, as it showcases your organization’s belief in accurate, valuable sources. Helpful for backlinks, too! While a loss in mass media trust presents some serious hurdles for PR professionals, it is also a serious opportunity. As audiences re-evaluate what content credibility looks like and who can be trusted, there’s a chance for you to step in and be that source with thought leadership pieces and strong influencer networks. This isn’t a new trend, by any means, but in the wake of declining media credibility and rise of misinformation, people are going to be in the market for new sources for content. Someone who has long followed and subscribed to your competitor’s content offerings may suddenly be looking for greener pastures. And, with this waning distrust in major media, citing key industry influencers, instead of once-respected news sources, is key. The challenge will be that, just as the market for fresh thought leadership heats up, so will the competition around securing good, credible influencers. To make matters even worse and more challenging, brands need to be very careful with how they pursue and secure influencer mentions. The traditional, paid means of developing influencer networks create a lot of issues with credibility. Even when influencers are transparent in their promotion, audiences see “sponsored” and it translates to “not credible. Increasingly, businesses need to choose influencers very carefully. The ideal candidates are ones that have established their own credibility, don’t engage in shady activities (buying followers, not being transparent enough with sponsorships, etc.) and are willing to join your influencer network to further non-financial gains. In other words, a great influencer network is created through mutually beneficial relationships. This may mean approaching up-and-coming experts in the industry, rather than established ones, that can benefit from a you-mention-me-I-mention-you relationship. Not only does this help create those valuable backlinks, but it also guarantees a stronger and more reliable influencer relationship because as you grow, they grow, which encourages them to share your content and products, mention your brand more often and link to your content. Digital marketing and public relations share a very close relationship one another. This proximity, however, creates a lot of confusion and crossover that muddles the differences between the two. As the lanes between the two become harder to distinguish, digital marketers start to look like competitors to PR professionals, when they should be complementary to one another. “Digital Marketing gurus” seem to pop up like new blades of grass. Their proliferation onto the market is alarming because it’s causing a number of issues with negative effects felt by other professionals. First, they blur the lines further by lumping advertising, marketing and PR into this false umbrella term. Second, a lot of these would-be experts are wide-eyed and bushy tailed recent grads that are decidedly not, despite what they tout, experts. Despite their inexperience, these greenhorns do land clients, often because they charge less than the established pros. Unfortunately, their lack of expertise quickly shines through. As a result, certain businesses have grown skeptical of digital marketers and even PR professionals. They’ve been burned by one of these supposed swiss army knife gurus that promised to do it all – and for next to nothing. This creates another problem because it undervalues the services of a true PR professional or qualified digital marketer and what those services cost. PR professionals need to work harder at defining what they do, why it is valuable and how it differs from what a digital marketer does. Instead of seeing it as competition, see it as an opportunity to connect and build partnerships. For what feels like a short lifetime, data analytics and AI technology have found themselves on nearly every list of top trends to watch out for. The technology to perpetually be on the cusp of being everything science fiction has fantasized about, but never quite there yet. If you’re sick of reading about the Big Data and AI future, I’ll summarize this point quickly. As data gets increasingly abundant, the need for fostering a proper data culture is important. Data is growing exponentially, even more than experts predicted. It’s more than doubling every two years, with new estimates suggesting that the total volume of data will reach 44 zettabytes by 2020\. In short, if you don’t have a data scientist staffed, hire one. Not only does an expert data scientist better protect your analysis projects from inaccuracies and errors, but they also are a crucial puzzle piece in helping your company and its employees understand what data analysis tools are necessary, what the capabilities and limitations of your data are and so much more. Technology is expensive and these specialized AI and analytics solutions are no exception. Staffing a data scientist guarantees that your investment into these products is appropriate and promises to yield the highest returns. Proper use of sophisticated AI and analytics tools will become a competitive differentiator; arguably, it already is. PR professionals armed with predictive analytics can detect crises brewing on the horizon and will be able to navigate uncertain times easier than those without. Similarly, AI chatbots can field large volumes of customer queries and complaints faster than a team of human professionals. Those organizations and PR professionals that are able to adopt data tools, hire data scientists and embrace AI tech will thrive in the future and widen the gap between themselves and non-data-focused competitors. The PR world is very much the same as it has always been, but these external factors are affecting the landscape. By recognizing these trends and changes, PR pros and digital marketeres will have a much easier time navigating this newly altered environment. These outside forces are going to continue to evolve and manipulate the PR space, which means a keen eye should be fixed on watching and monitoring how they progress through the end of the year and beyond.